“It’s all fun and games until someone gets hurt” reads the tagline for Ben Kent’s (Love Bug-2012) debut feature, F.U.B.A.R; a horror comedy that gives ‘zombie paintballing weekend’ a whole other meaning when a group of rowdy stags embark on an unforgettable trip they will soon come to regret! Sam (Sean Verey) is getting married and the significant men in his life, join together to celebrate his last lads weekend away before tying the knot! Led by the riotous Eric (Danny Kirrane); the band of boisterous boys and Sam’s very stern, ex-Navy Marine, father-in-law to be Gerald (Mark Heap) disembark on a Zombie Apocalypse Paintballing adventure in the glorious countryside. Upon arrival they are greeted by the regimental Sergeant Marshall (Tim Faraday) who puts them through their paces. Once left to their own devices events go awry, in a raucous, fast-paced Brit Zom-Com that offers up many, many twists and turns! Kent teases that the plot, ‘may or may not be based on a true story’, leaving the trajectory the film eventually takes as wildly ambiguous to the viewer. The story, co-written with Joel Wilenius was inspired by a personal friend’s experience in which he found himself in an unorthodox, boundary-breaking, zombie-survival stag do’ situation involving physical harm. Upon hearing this story, Kent was led to develop the idea further and bring the concept into an exaggerated film context. F.U.B.A.R is a film that is best approached knowing very little about the overall plot so that when the twists do implode they can be experienced to maximum effect. The film begins as a typical, loudmouth lads comedy littered with toilet humour in the vein of if The Inbetweeners grew up and were attempting to be forcibly funny. The testosterone-fuelled stereotypes are subsequently introduced, there’s the gormless groom, the henpecked husband/new father, the disapproving father-in-law, the reluctant brother-in-law, the obnoxious ladies’ man, the stoner (aka. ‘legend’’ of the group), the presumptuous work colleague and of course the previously mentioned indecent leader of the pack. as confusing in terms of one of the character’s motivations. On one hand it could be viewed as an Edgar Wright style of black comedy or even comparable to Christopher Smith’s Severance (2006) in what it seeks to achieve. However, the characters themselves are not fleshed out enough and are barely entertaining to watch. It’s a case of ‘Lads Behaving Badly’ are meant to equate to ‘unlikely heroes’ but in this instance the execution falls flat because they’re obnoxiously written, and the predicaments they become embroiled in are all too eye-rollingly predictable. Visually, the film cannot be faulted, the wilderness of the countryside compliments the suspense aspect the film strives to create. The vastness of the location brings the feeling that there could be hidden mysteries lurking around every corner, working effectively in the film’s initial build-up. It’s a well-made effort in its cinematography and editing, the main problem unfortunately comes from the humour within the script. Ultimately it takes the route of planting a group of men going through transitional periods in their lives whether it be marriage, fatherhood or clinging on to misspent youth, conveyed with stereotypes and overdone cheap laughs. F.U.B.A.R is first and foremost a comedy and doesn’t endeavour to take itself seriously. Humour is very subjective, but from a personal standpoint it came across as cliché-ridden, slightly mean-spirited and generally unfunny. 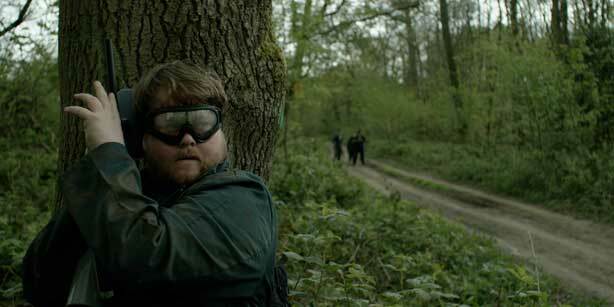 F.U.B.A.R is they year’s Eat Locals (2017); another British Black Comedy/Horror that failed to impress with its eagerness to nudge the audience into laughter with its glaringly cliched brand of humour. It all boils down to subjectivity, and sure, F.U.B.A.R will find its audience, it’s the sort of movie that’s best watched with a group of friends over a few beverages as its effortless viewing in a ‘switch your brain off and be entertained’ kind of way. It could easily be enjoyed outside of a horror audience with its accessible plot and comedic approach to horror that isn’t too nasty or gory.